Digital Cameras, Laptops, GPS Devices, Gaming Consoles, Camcorders, Satellite Radios and Portable Hard Drives and many more..
All you have to do is just select the Gadget you want to sell, answer a few questions about the product and based on the current market value, you will be offered a price from Gazelle.Once you are happy with the price you can add the product to the box and Gazelle would send you a box to pack the product and send it back, with free paid shipping.Gazelle removes all personal data from every item they receive.In case the Gazelle is not satisfied with the product’s condition it would make you another offer, which you may accept or decline and ask for the product to be returned. Gazelle inspects the product and and will send you the money either by Check,Paypal or you can even choose to donate the amount to charity. 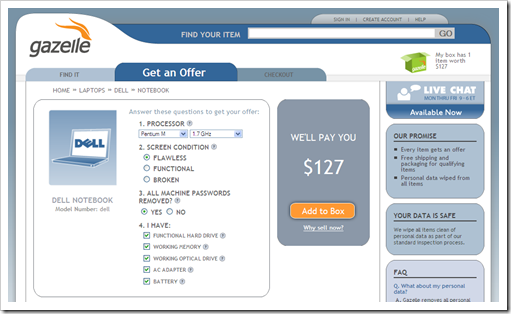 How Does Gazelle Calculate the price offer ? Gazelle has developed a patent pending engine that scans market data and considers the information you provide about your item to determine a fair market value. When an item has no resale value because it’s too old or doesn’t work Gazelle will recycle it for you, even if we can’t offer any money for the product. 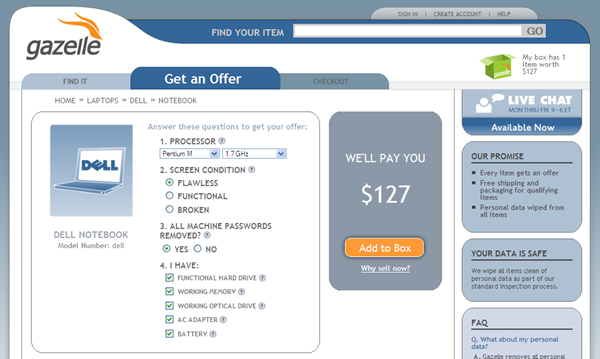 Hmm, Gazelle offers me about $200 for my 8 GB iPhone, not bad. If AT&T ever pisses me off to the point I drop my plan (very likely), I might sell the iPhone to Gazelle. Be nice to rejoin the cell-less crowd again.